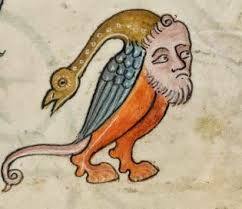 Spell Breathing does not come naturally to Rayne – she loathes the hours of practice, the stacks of scrolls, and the snapping mud devils that cover her mothers precious spell book. But it is spell breathing that keeps her village safe from the dreaded monster curse that plagues their world. It is ancient powerful magic, but as Rayne learns to her horror . . . it is also fragile. In one clumsy move, the magic that keeps them safe is broken, her village is plunged into danger, and an incredible adventure begins . . .
I’m unlikely to argue with Peter Bunzl – but I would like to add to his take. There is plenty of enchantment in The Last Spell Breather – and a good deal of charm, but also enough threat and peril to make a proper adventure. As you can see from Dinara Mirtalipova’s striking cover, there’s a fox involved. (I’m not surprised Peter Bunzl, creator of Malkin the mechanical fox, had to read it!) It and the spell book shown are essential to the plot which trots along with many a twist and upset for Rayne. The whole story is full of unique spells – ones that Rayne has to master, and that her best friend Tom is so wary of. The writing itself crackles with energy and bursts of light on a strange, fascinating world. Weirdness aside though, there is a heartwarming sense of community and family at its core. 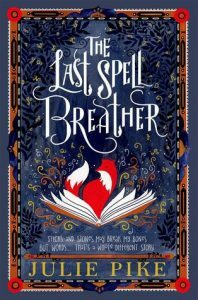 OUP recommend The Last Spell Breather for 9+, and whilst many an experienced younger reader could cope with the text, there is sufficient menace to scare the sensitive. Perfect for those who love reading exciting books from the likes of Abi Elphinstone, Vashti Hardy and Peter Bunzl. the next Julie Pike story – it was a two book deal! This entry was posted in Review and tagged fantasy, Julie Pike, magical adventure, MG, OUP by KMLockwood. Bookmark the permalink.